The Gran Majesto's 1.8 in. 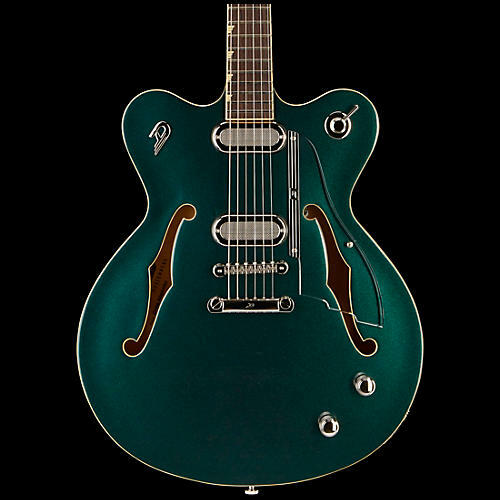 sides and semi-hollow construction, featuring a solid centerblock, provide you with typical Duesenberg flexibility from clean to rock tones and even further. The new open style-tuners allow for smooth tuning and weight reduction on the headstock and the new "Phonico" pickup line is candy for both your ears and your eyes. Additionally, the Gran Majesto features twin F-Holes, a floating pickguard and the new 4-Way rotary switch, which adds a new variation to the way you can combine pickups. The Gran Majesto double cutaway version comes in a stunning Catalina Green and is equipped with an aluminum stop-tailpiece. Includes hardshell case.